Take a peek inside the new issue of ImagineFX magazine – out now! 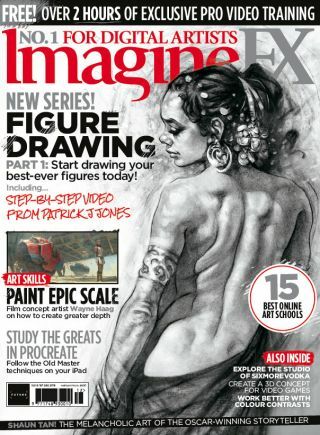 Start creating your best-ever life drawing figures with the latest issue of ImagineFX magazine, which is on sale in the UK today. Inside issue 167, artist Patrick J Jones explores the pitfalls to avoid when drawing figures from reference material in the first part of an epic in-depth series of tutorials. So if working from photos leaves your drawings looking flat and lifeless, this cover feature could be the solution you've been hunting for. Another good way to improve your art is to study the experts. That's just what Gavin O'Donnell explores in his Procreate workshop as he looks at the work of the Old Masters. Meanwhile, keyframe artist Ricardo Guimaraes takes to Photoshop to reveal how to create strong colour contrasts in your character designs. As well as these artistic insights, there's all the news, reviews and training you've come to expect from ImagineFX - you won't want to miss it! Explore what's on offer by taking a peek at the lead features, below. Gone are the days where art students had to stump up huge tuition fees to learn from the experts. Thanks to online courses, artists can pick up new skills without weighing themselves down with debt. We take a look at 15 of the best online art school you can attend from the comfort of your own home. Oscar-winning storyteller Shaun Tan shares his creative journey as we talk to him about his latest book. From humble beginnings in Western Australia, to working with the likes of Pixar, Tan's glittering career has gone on to inspire readers around the world, although he hasn't let it go to his head: "I'm kind of an artistic downer!" Artist Patrick J Jones kicks off his eight-part life drawing series with an instalment dedicated to drawing the female form from reference photos. Exploring the common pitfalls to avoid when drawing from reference imagery, Patrick's tutorials will also look at how to develop your own style. Last month, Warhammer concept artist Rinehart Appiah showed us how to concept a deadly war beast, and this issue Baj Singh is here to explain how to turn 2D creations into 3D characters. Those familiar with Wayne Haag's work will have been blown away by the sense of scale he packs into his art. In this tutorial, the sci-fi environment artist shares the fundamentals that will help you to communicate a sense of size in your own work.